Place a rack in the center of your oven and preheat to 350 degrees F.
Prepare a 12-cup muffin pan like this one (or 12 individual muffin cups). Brush with extra virgin olive oil. In a large measuring cup or a mixing bowl, add eggs, salt, pepper, and spices. Whisk well to combine. Place muffin pan or muffin cups on top of a sheet pan (to help catch any spills). Bake in heated oven for about 25 minutes or until the egg muffins are set. Let cool for a few minutes, then run a small butter knife around the edges of each muffin to loosen. Remove from pan and serve! Pro Tip: What to serve along for brunch. If you plan to serve these egg muffins as part of brunch, add a couple of salads like Greek salad, or balela salad and this Mediterranean orange and pomegranate salad. I also like to add a bread option and some roasted garlic hummus or baba ganoush to complete the Mediterranean fare. Pro-tip: Meal Prep. 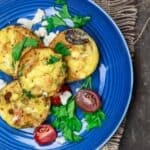 These egg muffins are great to make ahead and enjoy for breakfast-on-the-go. Let the egg muffins cool completely, then carefully pop them out and store in a glass container with a tight lid, or a ziptop bag. Store in the fridge for up to 3 days. Or, you can individually wrap and freeze them for 2 months. Pro-tip: This recipe is incredibly flexible. You can feel free to swap out the veggies or herbs to your liking. If you want to use firmer vegetables like carrots or broccoli for example, you might try cooking them first, then let them cool before using in the recipe. Some fun ingredient combinations: mushrooms, garlic, spinach, and feta. Or, tomato, mozzarella, basil, and prosciutto bits. Used in this Recipe: Private Reserve Greek Extra Virgin Olive Oil (from organically grown and processed Koroneiki olives); Spanish Paprika; and Organic Turmeric. Visit our store.